This recipe from parents.com is faster than fast food, healthful and delicious. 1/3 cup unsalted peanuts, chopped (see note below). Heat oil in a large nonstick skillet over medium-high heat. Add coleslaw mix and carrot; cook for 5 minutes, stirring occasionally, until partially wilted. Stir in 1/2 cup of the sauce and bring to a simmer. Stir in chicken. To serve, place greens on a large serving platter. 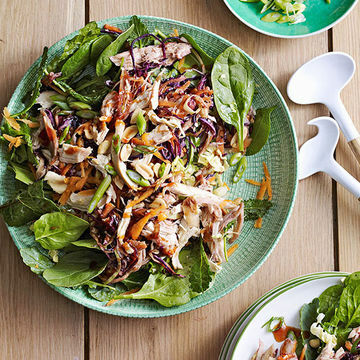 Spoon chicken mixture over greens and sprinkle with scallions and peanuts. Serve remaining 1/4 cup stir-fry sauce on the side for drizzling over salad. NOTE: If peanut allergies are an issue, soy nuts are an excellent substitute.